It’s about a year later now. I had finally finished with graphic design school and our three-man company had once again taken a hit. Tom had decided to move to Gainesville with his girlfriend so it was now down to two of us. Mike Schemmel and myself. Holding my newly acquired degree in hand, it was also time for me to make a decision. Like “The Clash” once sang, “Should I stay or should I go”. Without any hesitation I decided to push on with Black Pearl. I felt like we had come too far to quit now, as did Mike. It was now around the summer of 1993. 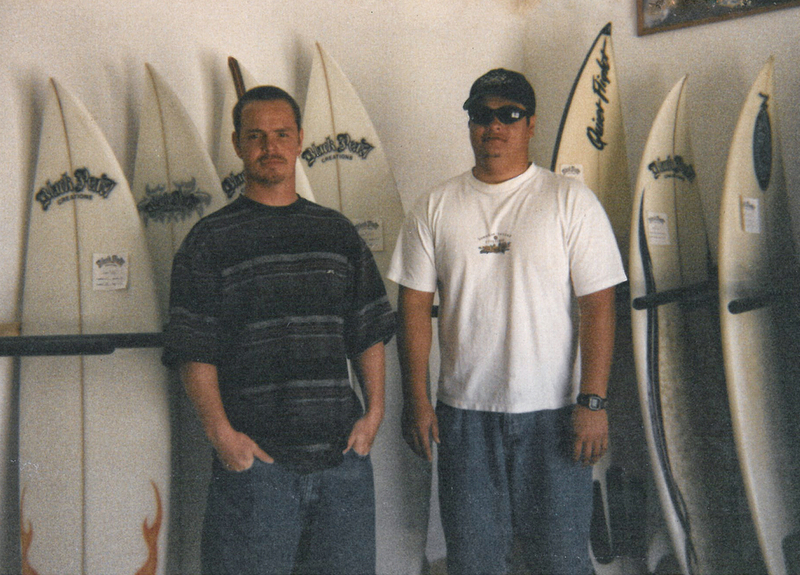 Two years had past since we decided to start a surfboard company and after a ton of trial and error, Mike and I decided it was time to become a legitament business. So we applied for a business license and got an accountant to make it official. We were still operating on cash-only sales. It was a long time coming, but Black Pearl Creations was now legit. No turning back. Over time, we developed a good working strategy and had a real good dynamic between the two of us. 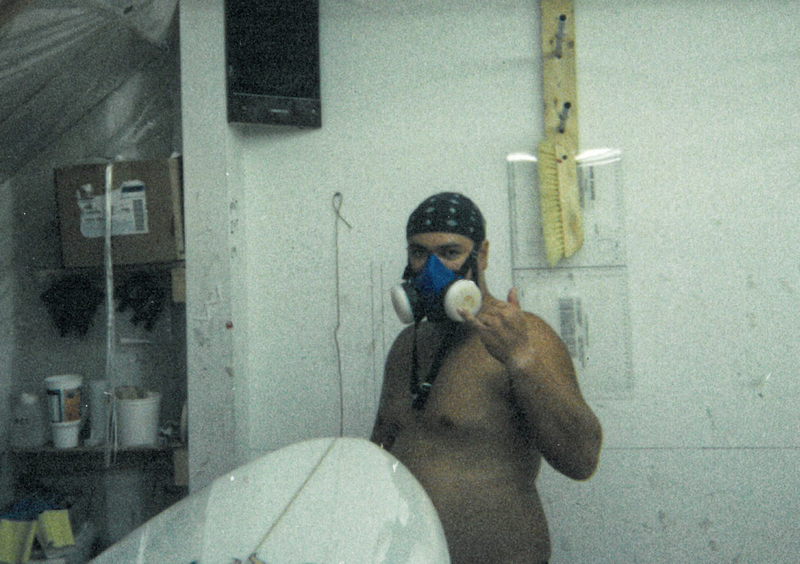 I became a full-time shaper and airbrusher, Mike would fiberglass and sand. Everything was really starting to fall into place. We moved into a slightly larger warehouse and built up a consistent clientele. Kevin, remember him? Well he moved away to St. Augustine, Fl. but for good reasons. While living there, he was going to represent our boards. Yes, another first for Kevin. He was now our official surfboard rep. which ended up paying off sooner rather than later. 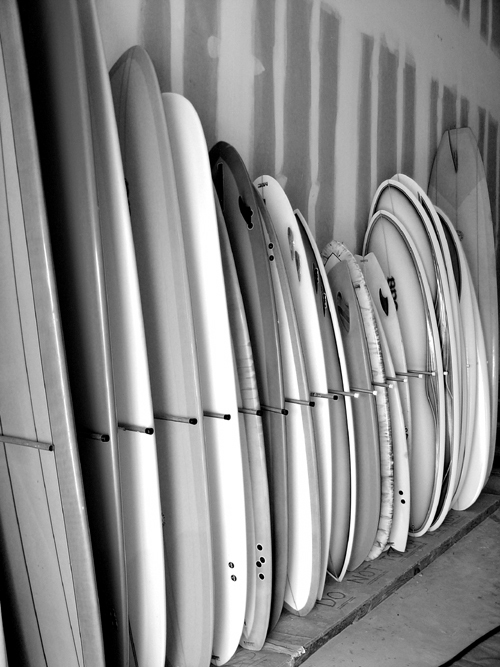 We found ourselves selling boards to a surf shop there named “FA’s” and soon developed a “following” with several of the locals. Our business was starting to move in the right direction. Speaking of move, with all the success we were having, we found ourselves starting to discuss business loans and the potential move to the beach. That was just a no brainer right? 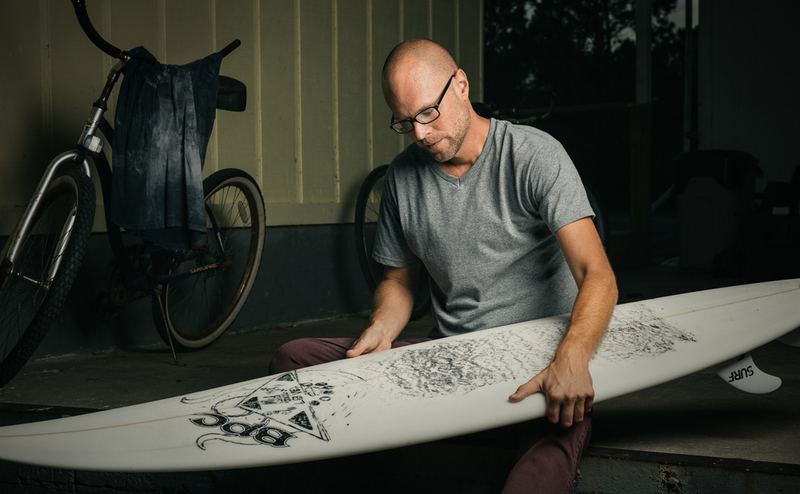 Manufacturing and selling surfboards at the beach? But where? Well, why not St. Augustine? We have a following there. Not a lot of competition in comparison to other places along the East Coast of Florida and oh yeah!, let’s not forget Kevin. So it was settled. We knew where we were going to move, but how were we going to move? We had equipment and supplies to deal with and we were going to need to find a warehouse, not to mention a place to live. That all requires money. So with the grace of God and the help of my parents, we were able to take out a business loan to get us going. The rest was up to us. Several years had past and there were many changes along the way. Kevin transitioned from being our rep to working in the factory sanding boards. 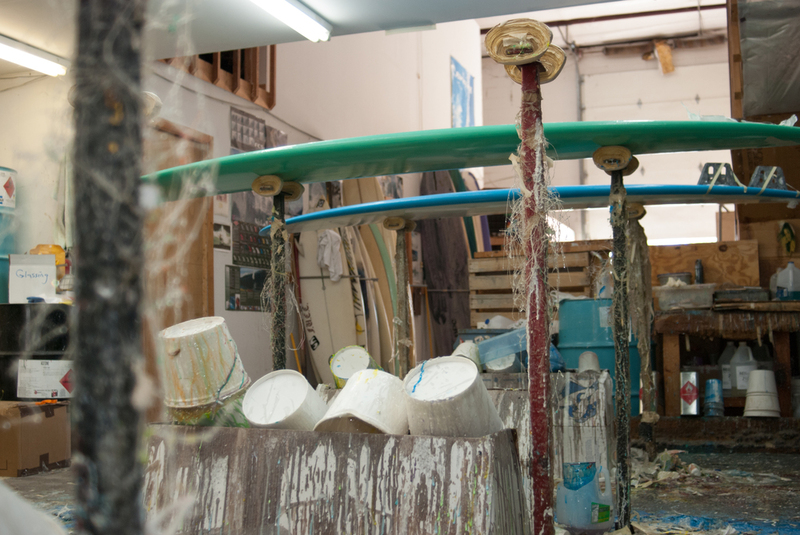 We expanded our facility, and FA’s Surf shop closed it’s doors, which ended up being a blessing in disguise because we had finally talked Tory Strange, owner of the Surf Station , into giving our boards a shot. The Surf Station was a far more reputable surf shop, and whom I give a huge amount of credit for taking our business to the next level. Thank you Tory for believing in us and giving us a chance. We had also picked up several new accounts all around the state, from Jacksonville to the panhandle in Panama City, down to Southeast Florida in Stuart. Things were really going well. Orders were coming in left and right. It was hard to keep up. We were on top of the world! Then, something we weren’t expecting happened. Something unimaginable. Mike Schemmel, my good friend and business partner, was diagnosed with Leukemia. I’ll never forget that day. I can’t even describe the feeling I had when his wife Mia, also a long time friend, told me the news. So many thoughts were spinning in my head. First and foremost, is this curable? How severe is this? Is my friend going to die? I didn't know much about Leukemia. I couldn’t even wrap my head around this. I can’t imagine what he was feeling. Then, other thoughts starting entering my mind. What’s going to happen with the business? Who’s going to replace Mike until he comes back? Is he coming back? Well, over the next several months some of those questions were answered. Thankfully, the biggest question of all was answered. It was curable and Mike was going to make it through this, but it was going to be a long process. He would need a bone marrow transplant. Fortunately, his brother was a compatible donor. MIke and his wife Mia soon found themselves moving to Gainesville, Florida where they would live for the next several months while he received treatment. Meanwhile, I had to keep pushing on with the business, after all that's what Mike would want. Changes had to be made and made quickly. The orders didn’t stop coming in just because of this tragedy. I needed to find a laminator and that wasn’t going to be easy. It’s not just a job you post in the local paper. It’s an extremely difficult skill, and there was no way I could keep up with shaping, airbrushing and add laminating to my list of jobs, not to mention, I wasn't very good at it. Luckily Kevin, once again, stepped up and took over as the laminator, which was a blessing. 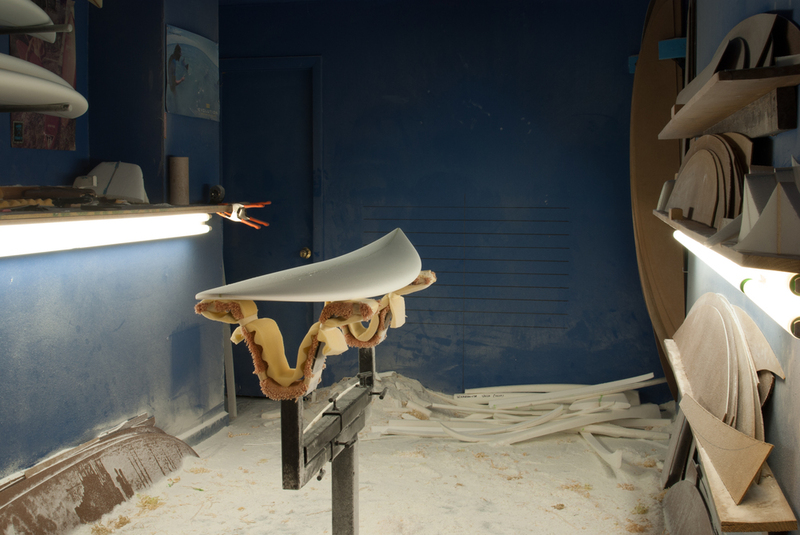 He already had a little knowledge about laming because of his experience working on his personal boards. You see, Kevin was one of those guys that wanted to learn every part of board building, not just one aspect, and to have a guy like that around when all hell breaks loose is a good thing. It was much easier to find, and train someone to sand boards, rather than to glass them, and Kevin developed quite a skill for laminating, and slowly, but surely things started get somewhat back to normal. I hired a new sander named Charlie and we were back running in full capacity. Fast forward, it was now 2003. 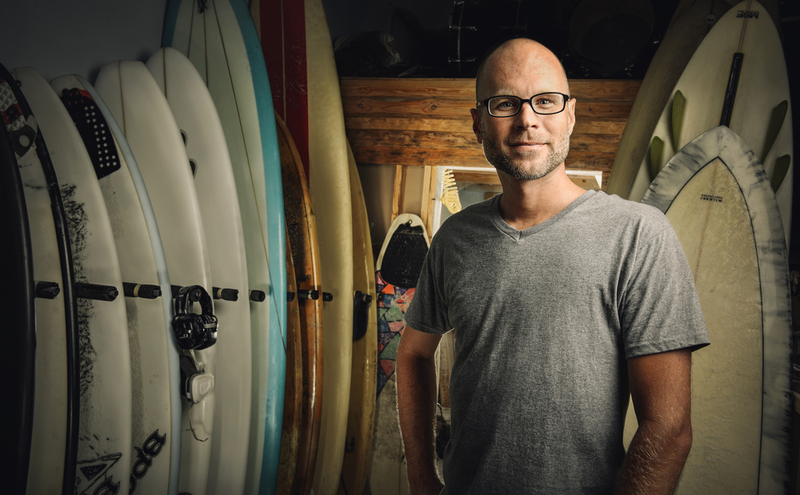 It has been three years since Mike found out he had Leukemia and unfortunately was unable to return to BPC due to the constant exposure of resin and chemicals used to build surfboards. Kevin and I continued to pump out as many boards as we could. Eventually, even doing a lot of contract work, building and manufacturing other companies’ boards, but over time, things started to wear on me. The place I loved so much was slowly tearing me down. I just couldn’t do it anymore. This feeling kept coming over me that it was time to stop. It was time to move on. I just got married and started a family, and it was time to make a change in my life. One that would benefit not only my family, but satisfy this feeling inside. It was time to sell Black Pearl. Something I thought about long and hard for quite sometime. So I went to the one person who had been with us from nearly the beginning. The one person who stuck with Mike and I through thick and thin, and quite frankly, the only person I would trust to take over what Mike and I had worked so hard to build. I asked Kevin if he was interested in taking over BPC. Thankfully, he said yes. This year is the 20th anniversary of Black Pearl Creations and the whole reason for sharing this story with you. Recently, to celebrate this exciting time, I did a photo shoot with Kevin to commemorate him for all his hard work and commitment to BPC. I’m extremely proud of him and all his accomplishments and happy to say that Kevin and BPC are still going strong to this day. Thank you Kevin, for all that you did and continue to do. I am truly blessed to be able to call you my friend. As far as Mike and I, well Mike is doing great. He is cured and well past his remission state, and is clean and clear from any and all cancer. He is still living back home in Winter Haven with his wife Mia where this story all began. As far as myself, I still live in St. Augustine, Florida with my beautiful wife, Vanessa, and my two awesome children, Christopher and Alexa. Having spent the past several years as a graphic designer, I have since redirected my creativity and career to photography, which has opened the door to a myriad of possibilities. Let’s just say, God is good.